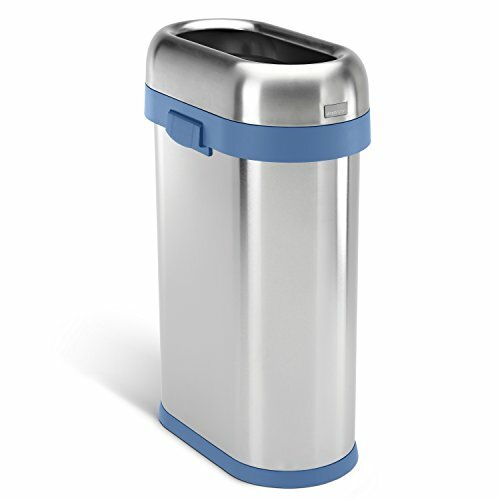 The simplehuman slim open can has a space-efficient shape designed for tight spaces, while its open lid makes it easy to toss in trash on the go. The heavy-gauge stainless steel construction, Lift-Off lid, and large capacity make it an ideal choice for busy, high-traffic areas such as restaurants, coffee shops and hotel lobbies. FITS IN TIGHT SPACES- Slim, narrow space-efficient shape is designed to fit tight spaces, like in-between cabinets. PERFECT FOR COMMERCIAL SPACES - Large capacity and an open lid make this an ideal choice for coffee shops, hotel lobbies or restaurants. HEAVY-GAUGE STAINLESS STEEL - Thick, heavy-gauge steel makes this can dent-resistant and sturdy. EASY, QUICK LINER CHANGE - Lid lifts off easily for a quick bag change. CONVENIENT SIDE HANDLES - Just grab the side handles to move the can. ENHANCE YOUR TRASH EXPERIENCE - Extra-strong and durable Code N custom fit liners fit this can perfectly for a cleaner trash experience.